Food and Drug Administration, is called as: FDA, which is one of the enforcement agencies established by the U.S. government in the department of health and human services (DHHS) and the public health department (PHS). With the rapid development of manufacturing industry. Of course, more and more high precision CNC machined parts also are widely used in food, Medical, Aerospace and Oil&Gas industries. it means the trend of the CNC machining development is more and more widely and advanced. And we also need to provide more certifications to ensure the quality and safety of the parts. FDA certification material and common material essential difference is the price. For example: PEEK material. One common peek plate material, you can order it less than $130/kg in the marketing, but FDA certification PEEK material cost is beyond our expectation. Its price over $200/kg, and it has MOQ, so the total cost is over several thousand dollars. Of course, welcome visit our metal sheet guide for details we have machined now. FDA certification is necessary for High Precision Machined Parts? For the FDA certification material. When we got one inquiry from food customers, they need to produce a batch of products with food grade material. Of course, also need to provide relevant FDA material certification for the food safety. If so, we only need to look for one material supplier (they can provide it), and ensure the material is true and effective, and this certification can be checked on special agency website. When we got one inquiry from Medical customer. Except for high precision, high accuracy, close tolerance of requirements, the FDA certification is very importance as well as. If so, We need to ensure the whole products pass FDA certification before shipping. And can provide one copy the whole Testing Reports to our customers for checking. Now, both medical, consumer product like coffee machines have to request all of these high precision machined parts need to provide FDA material, and meanings all of our materials, machines, our team and quality system must have high standard to meet customers. 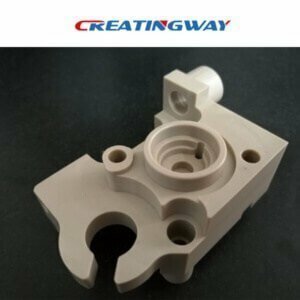 As one High Precision Machined Parts manufacturer, Creatingway not only can provide all kinds of common metal and plastic material, also can provide some FOOD grade materials to meet the needs of our customers. Welcome inquire us, and start your next projects now.